The Association of Applied Geochemists’ Silver Medal is awarded to those who voluntarily devote extraordinary time and energy to the affairs of our organization. This year’s Silver Medalist, Beth McClenaghan, is strongly deserving of this reward. Beth has been an AAG Fellow for some 23 years. During this time she has served the Association as a Councilor, has organized numerous workshops presented at our IAGS symposia including the 27th IAGS, has served on IAGS organizing committees, and has chaired sessions for the same. She is currently editor of the Association’s newsletter, EXPLORE, a position Beth has held since 2005. As you all know, this newsletter is extremely important for promoting the Association, as a vehicle for disseminating information to AAG membership, and for promoting the science of applied geochemistry. Under Beth, the newsletter has been enhanced on several fronts. Beth was instrumental in getting all of the AEG and AAG newsletters—from the earliest 1970s to the present—digitized, on-line, and available for download from the AAG website. As most of you know, Beth is also a very accomplished research scientist with the Geological Survey of Canada where she has worked for the past 24 years. Her research has focused on till geochemistry and indicator mineral methods applied to exploration in glaciated terrain, with particular emphasis on gold, diamonds, and base metal deposits. 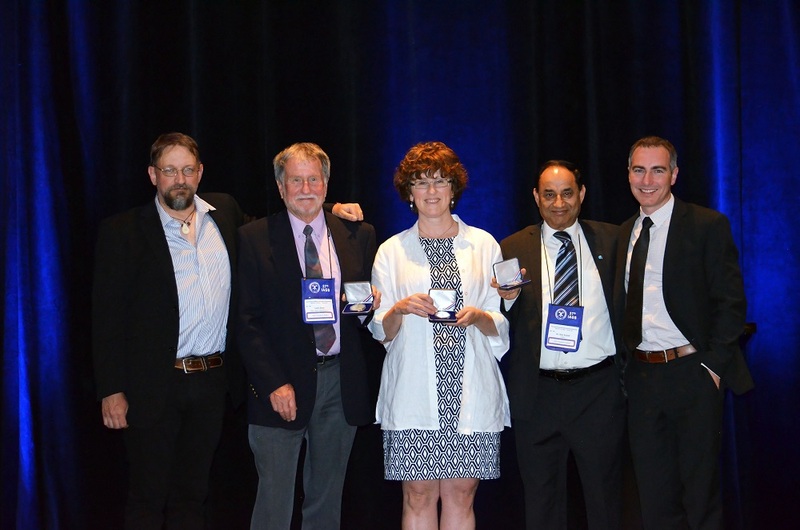 AAG President, Matt Leybourne, Colin Dunn, Beth McClenaghan, Ravi Anand, AAG Vice President Ryan Noble.